LAS VEGAS—So what do Bruno Mars and AmericInn have in common? 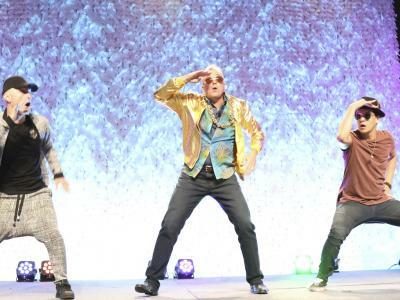 According to the lodging chain’s president/CEO Paul Kirwin, who yesterday channeled the pop star’s amped-up dance moves in a hip-hop routine to open the 2017 AmericInn Convention and Trade Show here at Bally’s, it’s the key attributes of persistence, improvement and dedication to history, legacy and identity. While an odd symbiosis at first glance, the CEO gave a synopsis of Mars’ struggles to get to the superstardom he currently enjoys, noting the musician’s commitment to continuous improvement, adaptation and evolution, and suggested parallels to the midscale chain’s growth and expansion. That said, the CEO termed 2016 “a very successful year,” setting a record in terms of revenue, which came in at $220 million systemwide, with comp unit RevPAR growth just over one percent. He noted there were three categories that created a drag on occupancy, primarily properties in the so-called “oil patches” in states like Oklahoma, Texas and North Dakota; the trickle down in agricultural areas where farm prices have taken a beating; and supply growth in larger markets. “We were happy, all in all, that occupancy was flat, given those challenges. What really drove the growth in comp unit RevPAR was our performance on ADR; we did an all-time high of $94,” said Kirwin. Looking ahead, Kirwin anticipates a strong summer season and the debut of the company’s first television advertising campaign, and urged attendees to “make hay” in the upcoming season.